I am on the road in my RV! My very first solo trip. I left my daughter’s near Raleigh, N.C., heading up into Virginia to traverse the Skyline Drive of Shenandoah National Park (Yes, I got my lifetime National Parks pass, too!). Along the way I have been visiting friends and family. I have gone to the Andrew Wyeth museum for an important retrospective, seen an amazing factual movie on Monarch butterflies, had great discussions and followed the progress of Hurricane Harvey. 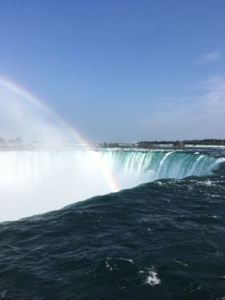 And, on Monday, I went to see Niagara Falls. For the first time. My parents honeymooned there, so I have wanted to see the Falls in person since I was very, very young. The tour company cancelled my tour as I was driving to Niagara. Fortunately, I had to go on a longer trip, which took in both the American and Canadian sides of the Falls. It took most of the day. There were 21 people on our bus, of every description, age and nationality. It turned out that all of us looked after each other, shared our amazement, swapped pictures and e-mail addresses, and worked as a team when we all got confused about where we were to meet Josh, our tour leader! As it ended, when each party disembarked at their hotel, the rest of us chorused a “good-bye” and thanked them for sharing our day. Perhaps this has happened for you. Perhaps not. When it happened in my life, I began looking for the reasons “why.” I can only speak for myself, so I will tell you what I have concluded: I exuded love all day and it came back to me in copious quantities. It started in a Home Depot parking lot early in the day when I connected with two friends who were spending their vacation time together after having gone different ways after college. Connie now works in the SF Bay area as an auditor. Her friend, Jane, is a master’s degree student at Columbia University. Jane’s family lives in Shanghai. She has been in the U.S. for several years. She also works with numbers (not my thing)! As we waited for our ride, we got to know each other. Throughout the day, we moved in and out of viewing the sights in each other’s company. Also during the day, Nancy and Rene were coping with his two back surgeries and Nancy’s recent hip surgery. Rene was using a fold-up walker, much like the one my husband, Bob, had during his five-year illness. They had to move this walker onto and off of the bus every time we stopped at a viewing destination. It became my pleasure to move the walker for them, which they appreciated. Rene had been a long-distance truck driver, whose driving days were ended when he fell on ice in his company’s parking lot. He spent quite a bit of time talking about what he can do, including the carpentry as they remodel their kitchen at home. At one point, I told him that, as far as I was concerned, he did not have to push himself so hard on the tour, moving fast even though it would put him in pain for the next day. I told him people would be okay to go a little slower, realizing that he pays a price for pushing himself. Rene did not want to hold anybody back. Loud and gruff, he nonetheless was thinking about the impact he would have on others. Tom and Kathlene and their granddaughter, MJ, were quiet but observant. Another man, tall and stately and with very long hair, worked to help the group when we were not sure where to meet our tour guide. I did not get his name. He took quick action, and walked back through the exhibit with the help of a guard. Others helped each other get group photos. In very simple ways, we just looked after ourselves and one another. And we shared the power of the water and the beauty of the falls. The Principle is this: What you have inside of you, you tend to attract from outside of you! I know that I was loving myself and allowing myself to love those around me. One of the key characteristics of love is RESPECT, the demonstrated ability to accept others just as they are. I was interested in talking with people that day, so I respected myself by allowing myself to move through the group, talk with people and find out more about them (that is one of the skills of Love, too, being interested to find out more about others), and share the experience with people who were strangers to me yesterday. I loved myself by allowing myself to follow my own heart—and it allowed others to open their hearts to me. Connie and Jane and I exchanged phone numbers when we were figuring out where to meet our tour guide. 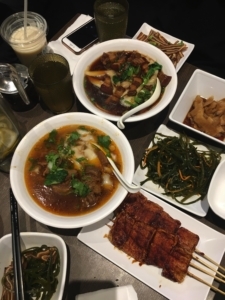 They took advantage of having my number to send me pictures of the authentic Chinese meal they had in Toronto later that night. My day was filled with love. I believe that was because I was filled with love. Clearly, many of the people on my tour had love in them too. That’s what we shared, all day.